Duncan’s curiosity has got him into a lot of tight spots – quite literally! As a teenager, Duncan really wanted to be an astronaut but took to the exploration of inner space instead. Only a dozen men might have stood on the moon but Duncan has squeezed into many places that no one has ever been before, and some places that no one is ever likely to go again (probably for a very good reason). These memoirs recount the author’s misadventures during his thirty-year involvement with caving and cave diving beginning with student antics in the caves of the Mendip Hills to a hair raising escape from deep beneath an English stately home. Along the way we are treated to a rollercoaster of emotions – from the joys of discovering new caves to the sadness of losing close friends. Duncan tells his tales without holding back, often making light of quite serious situations: cave-ins, serious illness and an embarrassing incident with a tick. There are tears and laughter, often at the same time: who else would perform an animal impression with a suspected metatarsal fracture? 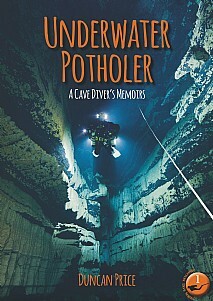 This will be of huge interest and a gripping read for all cave divers and cave diving enthusiasts, anyone interested in the outdoors, exploration and the natural world.